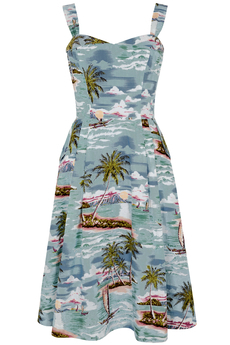 Pippa Sun-dress in Pacific Paradise Island takes inspiration from the '50s. Features wide gathered shoulder straps, a sweetheart neckline and an A-line skirt with button detail pockets. Fitted at the waistline, with flat pleats on the hips and back to create a flattering silhouette. Has concealed back zip fastening, is fully lined and is approx. 105cm in length. New Summer 2019 Collection. Composition: 100% Cotton. Lining: 100% Cotton.